The E-Z-Flex connector kits are available in two standard configurations. Each kit contains sixteen connectors, both offering 4 unique sized pins and sockets in flexible insulated shields. 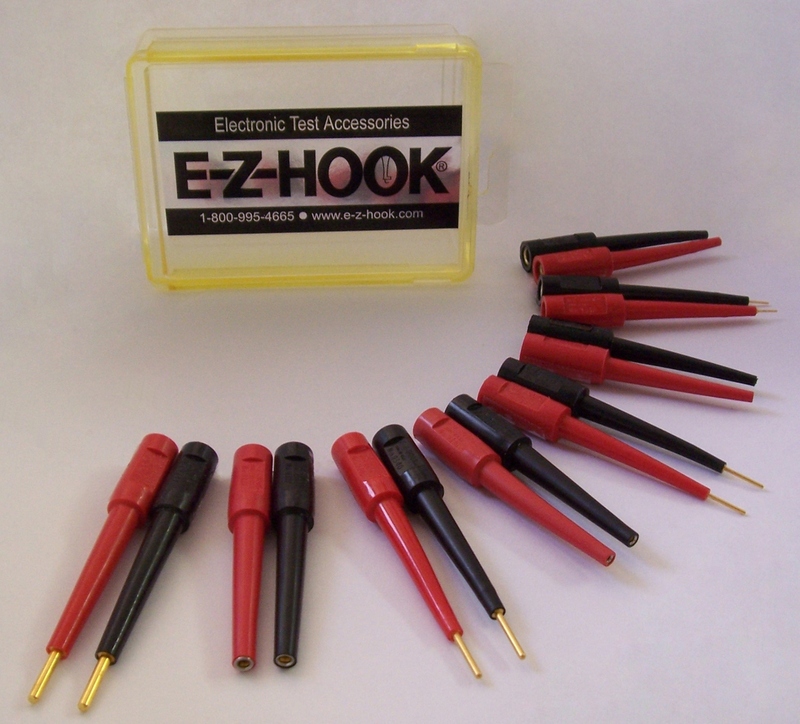 E-Z-Hook’s original flexible connector kit p/n 9099-0316 was designed for both the automotive and aerospace fields. Since it’s inception it has found popularity across multiple industries where electronic connections are required. This kit offers all connectors with a standard banana socket on one side, and eight varying sizes of gold plated pins and socket connectors on the other end. The pin and socket dimensions included in the kit are .030″ (.762mm), .040″ (1.016mm), .062″ (1.575mm), and .094″ (2.388). The flexible insulation is a molded plastic, provided in both red and black. A few years ago E-Z-Hook was approached by a large US based generator company servicing the telecommunication, industrial, and commercial industries. They liked the versatility of the e-z-flex components, however they required a .080″ pin socket instead of a banana socket in our E-Z-Flex connector line. We created some customized pin and socket dimensions specifically for their use. This customer driven project made us recognize a simple need that many of our customers across industries required. With those requirements in mind E-Z-Hook created our 9099-0491 kit product line. This E-Z-Flex kit 9099-0491 was introduced in late 2015 and provides all E-Z-Flex connectors with .080″ pin sockets on the one side. When your connection component has a pin plug this versatile kit provides the solution. All parts in both kits are also available individually for purchase.